In 2014 I wrote a Perspective entitled ‘Inquiry – A Much Abused Term’. It is disheartening to report that I think we have now gone to ‘Inquiry Abuse’ in a major way. 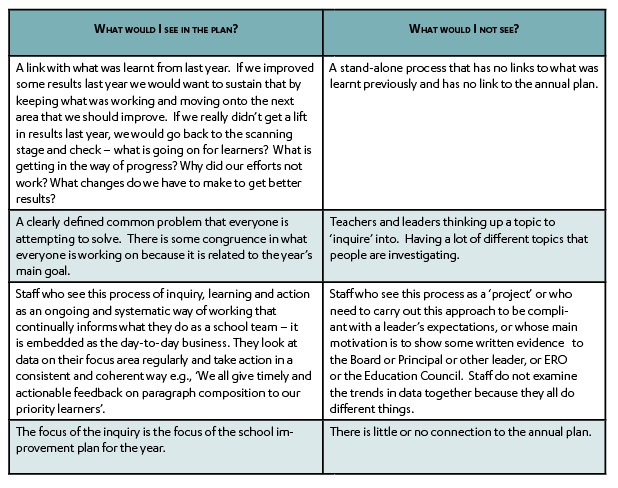 I often hear how individual teachers are doing ‘their inquiry’ or that they have to ‘do two or three inquiries a year’. I also see teachers filling in a lot of paperwork that they tell me is repetitive and adding no value to their work. This leads me to think that, frequently, ‘inquiry’ has become yet another compliance activity (i.e., a ‘project’ to be completed), and quite possibly another time-waster for teachers, as opposed to a genuine and automatic part of the teaching cycle that involves checking one’s own effectiveness. Individual inquiry is a normal part of the teaching process; it occurs when teachers ask: ‘Who have I impacted’, ‘How much’, and ‘Why/why not’? This evaluative thinking leads them to confirm or revise their practice. Perhaps the problem is that people are being told to produce evidence of teaching competencies as part of the appraisal process but are not clear on what ‘good evidence’ might look like, and so buy into using ‘packages’ that are time-consuming, and, potentially, are adding little value to their work. Evidence of effectiveness does not require an essay to be written. Surely such evidence can be provided by ordinary day-to-day record keeping such as a unit plan where one evaluates one’s impact, or through records of student progress in a taught area. Getting school-wide or department-wide improvement, however, needs a collective focus on a shared problem. 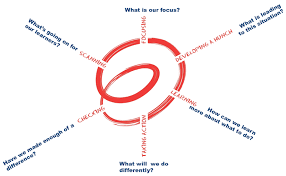 This is what the ‘cycle of inquiry, learning and action’ (Timperley et al., 2014) is about. The cycle of inquiry, learning and action is not about ‘individual inquiries’. It is a collaborative process within a school to investigate a team’s impact on learning. It is a problem identification and problem-solving cycle and it is recorded in the annual improvement plan under a target. It is not removed from the normal day-to-day work of the school improvement focus. The process should be focused on your key goal/area for improvement in your school’s annual plan. Everyone has written or is finalising their plan for the 2018 year now. If this process of inquiry, learning and action was working what would I see? What would I not see? Scanning involves gathering wider data on what is happening for learners. This does not have to involve large scale research or data collection. If every teacher talked to three learners per class with well-designed questions, they would find out a lot about what is going on for the learners. ‘What is their emotional response to the school?’ There is often a tension between thoroughness at this stage and getting on with the job – don’t skim on the scanning but don’t take too long about it either or you will lose traction and energy. Focusing involves learning more deeply about one aspect that has arisen in scanning. For example, instead of focusing on written language it is far more manageable to focus on paragraph construction. Instead of focusing on self-management it is easier to focus on the ability to complete homework three nights a week. This focus also has the benefit of having school-wide application and data is far easier to gather and to quantify. Is there sufficient expertise to help us? Is there a reasonable level of commitment/understanding? What is the evidence of shift going to be? Having a hunch about the cause of the problem and testing that hunch, in reality, occurs right across these early stages of the inquiry. You are testing hunches about the cause of the problem (e.g., poor written language; poor retention of students) when you talk to students in the scanning stage, when you gather information and analyse samples in the focusing stage, and when you move on to learning more about your own effectiveness and take action. What is key at this stage is to check out the influence of the leaders as well as the teachers. What actions or inactions of leaders might be contributing to the problem (e.g., Are systems you have set up adding value or creating a problem? ; What are you paying attention to as a leader and emphasising? ). Often leaders are quick to see teacher capability as the problem rather than their own. Getting contrasting views on causes of the problem is vital; parent voice can be useful to provide another point of view. Learning how to respond to the issue requires a carefully tailored approach that works on the causes of the problem that you identified when you checked out your hunches. For example, you may have found out that most learners who are late to school, had younger siblings to drop off at their schools first, or that most learners and their families do not value homework but rather expect and want all work to be done at school. External or internal expertise or finding research articles that are relevant may help with learning how to respond to these challenges. Learning is part of the action to get shifts on outcomes, but it will not be enough. Taking action is the heart of the matter and requires a sense of urgency to get shifts. It often involves changes to organisational structures and expectations, and changes to teachers’ and leaders’ practices. Ask yourself, ‘What could we do that would improve the outcomes?’ This usually means that everyone agrees to some consistent, high leverage practices that are soundly based on research or evidence as being effective e.g., Everyone expects a paragraph to be written in a certain way; Everyone has the same expectations of learners’ ability to self-manage; Everyone is targeting three at-risk learners in their class for extra help. Consistency of expectations and practices is key to getting improvement. These changes are your theory for improvement and should be documented in your annual improvement plan. Checking or measuring progress regularly is a critical action that makes a big difference. Expect change. Have short-term outcomes that you are focused on every term at least. I often hear people say, ‘We can’t expect results within a year or two’. That is a recipe for non-improvement because improvement is not expected. Seek small shifts each term in learner outcomes and in teacher and leader behaviours. When we see big shifts, we usually find that the monitoring is very, very tight e.g., Often it occurred every two or three weeks and schools had formed a small ‘data team’ to prepare the data for sharing with the wider team. Their task involved gathering the data on the regular reviews of the ‘narrow’ data you focus on (e.g., How many learners reach our desired standard in paragraph writing? ; How many displayed the self-management skills we were seeking this week? ; How many learners achieved all their literacy credits this week?). This urgency and attention to what you are trying to change is a key action that makes a big difference. This is the concept of ‘quick wins’ or ‘small wins’ that is fundamental to change; quick wins motivate every-one and you can only get quick wins by concentrating on one narrow focus area at a time. Your annual improvement plan is your record of the learning, action and measures you will take to improve outcomes. This is where you document your inquiry! You don’t need a fancy essay. So, in summary, the cycle of inquiry, learning and action is about taking collective, purposeful action. It is not about endlessly ‘inquiring’ into a plethora of ad hoc topics by individuals. If you want to learn more about this process, check out our template for writing an annual improvement plan or look into attending a Growing Great Leaders GGL™ Level 1 or Level 2 course. GGL™ Level 1 teaches the basics of educational leadership that you need to enact this process while GGL™ Level 2 course walks you through the process over the course of the year and critiques your efforts. These courses start in Auckland and Hamilton in early March (we will run them anywhere in the country with 15+ attendees. Email uacel@auckland.ac.nz.). Or learn more about having effective conversations to get improvement through our Open-to-learning™ Leadership courses. The ability to express your views clearly, to understand others’ views and to openly evaluate differing ideas in a transparent and public way is one of the most critical behaviours underpinning this process and fundamental to being an effective leader. Professor Alan Daly is visiting the University of Auckland, delivering a free lecture on 14 March from 5:00pm - 6:30pm. This lecture will highlight findings from recent research in social networks and offer insights into the role of the social side of supporting education communities from a leadership and policy perspective.